Above, students participate in the Adrian Project, a day-long mock criminal investigation. Rider students from the College of Business Administration were able to see what it was like to work as Internal Revenue Service (IRS) agents. The Adrian Project is a student fraud conference held by the IRS. Rider was chosen to represent New Jersey because of the forensics concentration program offered. Students were broken into teams and assigned an IRS agent. 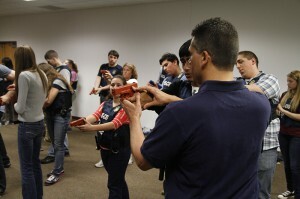 The teams were able to practice surveillance and investigation techniques, carry mock-concealed firearms and interact in a staged arrest wearing IRS criminal investigation vests.